Energy investors should know that America is the country that made coal king. Coal from Southern and Midwestern states is what helped build the strongest economy in the world. Some of the companies that made that possible are still around and are still solid investments. Peabody Energy (NYSE: BTU) is a large blue chip coal miner with a $5.9 billion market cap and revenue of $8 billion. Sales fell 9.5 percent in 2012 over 2011. Peabody mines both thermal coal and metallurgical coal and has majority interests in 28 coal projects in the United States and Australia. It also trades and brokers coal, serving clients in almost 30 countries on 6 continents. At the end of 2012, Peabody had around 9 billion tons of proven and probable reserves and was well positioned for high-growth Asian markets with sales volumes for thermal and metallurgical coal from Australia both breaking records. CONSOL Energy (NYSE: CNX) is a blue chip coal miner with headquarters in Pittsburgh, Pennsylvania. Consol has a $7.7 billion market cap and revenue of $5.4 billion. Sales were down 12.6 percent in 2011. The company produces Appalachian coal for sale to electric utilities and steel makers worldwide and is also a leading natural gas producer in the Marcellus and Utica Shales. Its coal division mines and processes both metallurgical and thermal coal. It’s not a pure play on coal, however, as a substantial percent of its revenue comes from its gas division, which explores for unconventional gas, including coal bed methane. At the end of 2012, it owned more coal reserves than any other U.S. company, controlling 4.5 billion tons. CONSOL also controls 4 trillion cubic feet of proven natural gas reserves. Alpha Natural Resources (NYSE: ANR) is a mid-cap coal miner with a market value of $1.8 billion. In 2012, the company had revenue of $7 billion, which was down 19.8 percent from the year before. Alpha Natural Resources is the world’s sixth largest producer of thermal coal and the third largest producer of metallurgical coal. Its operations are located in West Virginia, Virginia, Pennsylvania, Kentucky, and Wyoming, and it ships to customers on five continents. It can export from multiple terminals on the East and Gulf coasts, and it has a 41 percent interest in Dominion Terminal Associates in Newport News, Virginia. The company has 145 mines and controls 4.7 billion tons of coal reserves. Arch Coal (NYSE: ACI) has $1.2 billion market cap on $4.1 billion in sales. Revenue for 2012 fell 27.1 percent over 2011. Arch Coal produces and sells both types of coal from surface and underground mines in the United States. It has mines in every major U.S. basin, including Powder River, Appalachia, Western Bituminous, and Illinois. Arch controls 5.5 billion tons of coal reserves. Walter Energy (NYSE: WLT) is a mid-major with $1.9 billion market cap on sales of $2.4 billion. Walter saw its revenues drop 33.1 percent in 2012 over 2011. It operates surface and underground mines in the United States, Canada, and the United Kingdom and controls more than 330 million tons of reserves. Walter also has a subsidiary specializing in specialized blends of coking coal as well as a coal-bed methane gas division with more than 1,700 wells that produced 18.1 billion cubic feet in 2012. American coal miners have been through a tough slog. 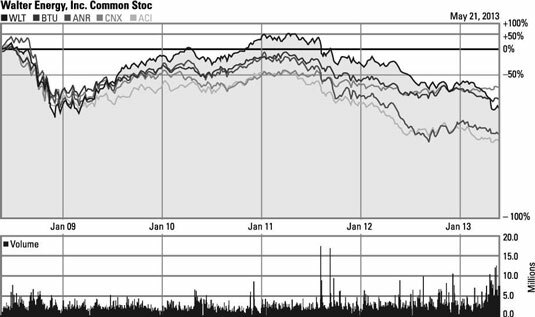 Cheap natural gas and oppressive EPA regulations made most investors sell U.S. coal over the past few years, with the major players down more than 50 percent since 2008, as seen in this figure. Since late 2012, some of those stocks have shown signs of appreciation. In the final quarter of 2012, Peabody, Alpha Natural Resources, CONSOL Energy, and Arch Coal all beat the earnings expectations of analysts. And other than Arch Coal, the other companies registered better-than-expected revenue for the quarter. This table shows earnings per share (EPS) and revenue beat for these companies for the fourth quarter (4Q) of 2012.